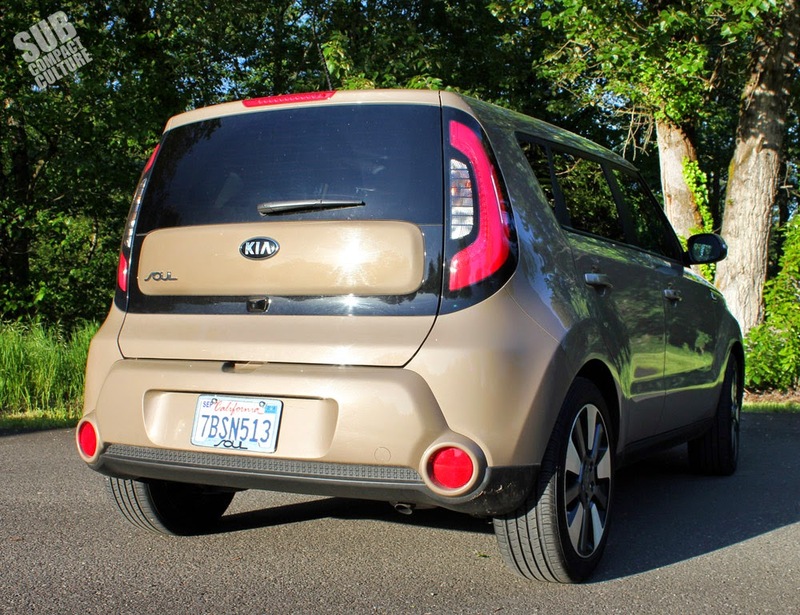 When I drove the 2014 Kia Soul at the launch in Minneapolis last October, it was obvious Kia had done its homework. Many of the things people complained about had been addressed. Things such as interior noise, ride quality, and braking were all improved compared to the first generation Hamsterwagon. However, one can only glean so much from driving a car for a day. 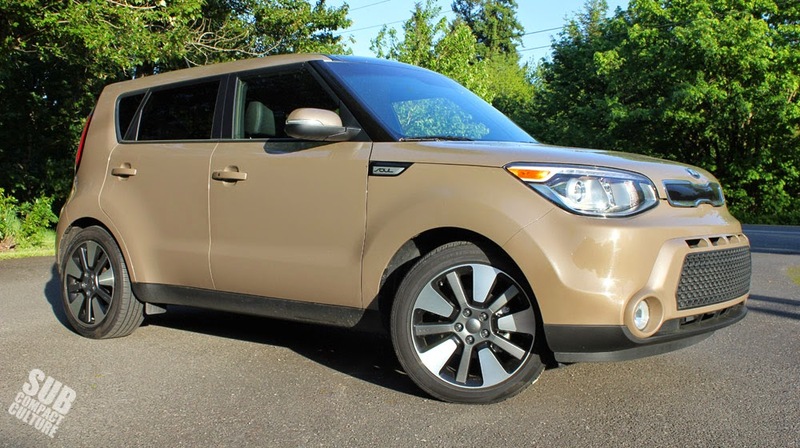 But after spending a week with the ’14 Soul, I got a better understanding of the good and the not-so-good. I still think Kia has done a great job with the exterior. It’s refreshed enough to be updated, but not so much that it tampers with the overall look. It is still unmistakably a Soul. In particular, I really like the revised rear end, which looks fresh and modern without looking too over-styled. The front is new, too—actually the whole thing is new—but like I said, it’s still a Soul at every angle. Will it be dated looking in 10 years? Maybe. However, the shape will still be unmistakable. Personally, I dig the Latte Brown color, which is a non-metallic paint shade. Some thought it was a bit dowdy, but I like it. And while the 18” wheels and tires look good size-wise, I can’t warm up to the machined-and-black style. When will this fad go away? Powered by a 164 horsepower 2.0-liter GDI four-cylinder, the car is peppy, even when mated to the six-speed automatic—the only transmission available with this powerplant. The revised suspension system is improved over the previous generation, but that being said, it isn’t a luxurious ride. 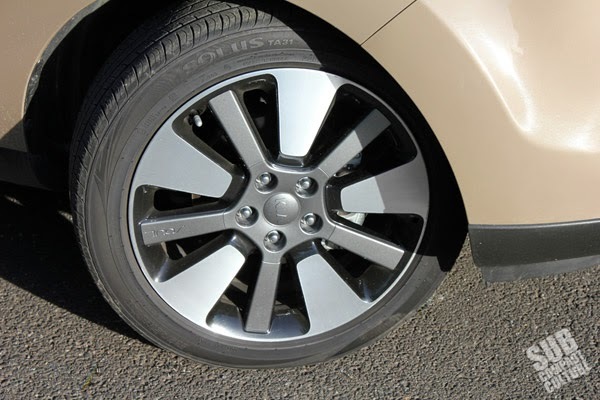 Part of that is due to the low-profilte 18” tires; part of that is due to stiff suspension tuning. This Soul has variable steering with multiple modes. I found the sport mode to be too sensitive; normal and comfort were significantly better, but still not quite spot-on. The driving position is very upright, and the seats didn’t have a whole lot of bolstering, although they are comfortable. And while the Soul does have a sporty quality in its appearance, it isn’t a driver’s car, and and those looking for top-notch driving dynamics won’t be impressed. 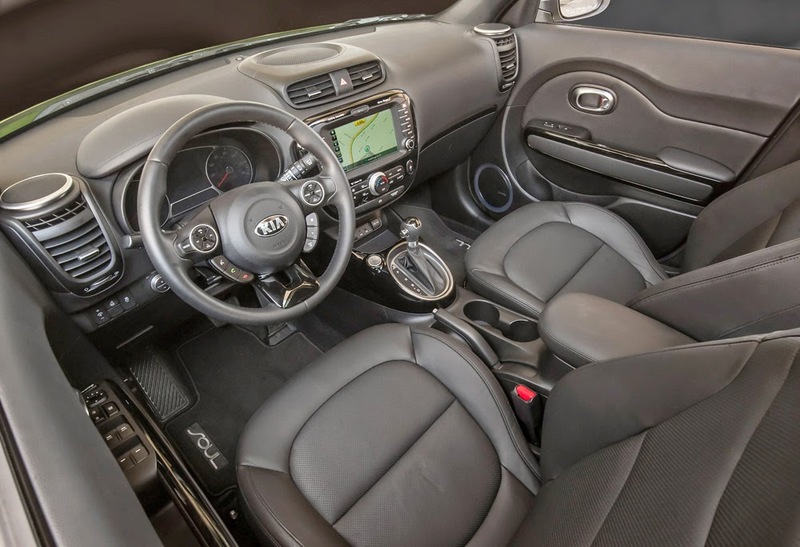 If you want a compact Kia that’s sporty, check out the ’14 Forte. It’s quite good. What the Soul lacks in driving enthusiasm, it makes up for in its interior. 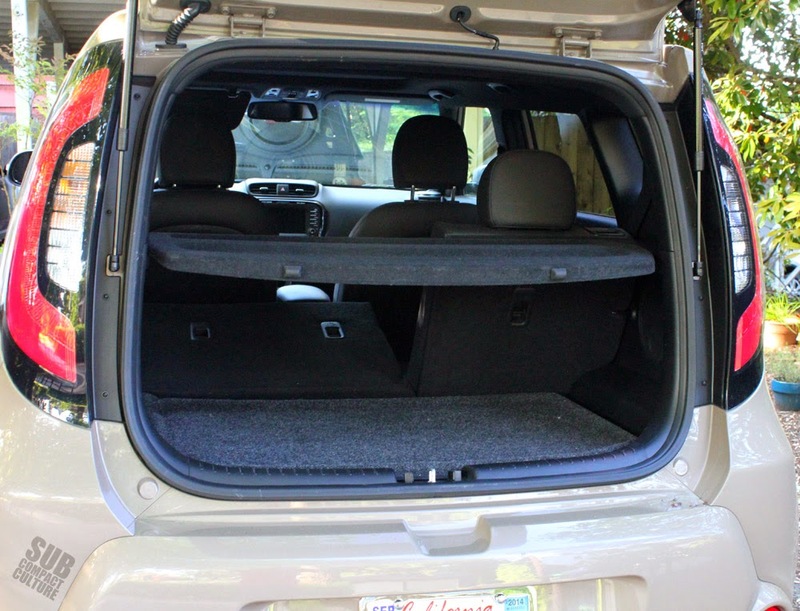 It feels upscale and is certainly the vehicle’s highpoint. I honestly loved spending time here. There are little touches, such as the black headliner, LED interior lighting, the great UVO infotainment, and possibly the coolest moonroof on the market that make this a standout not only in the compact market, but in any segment. 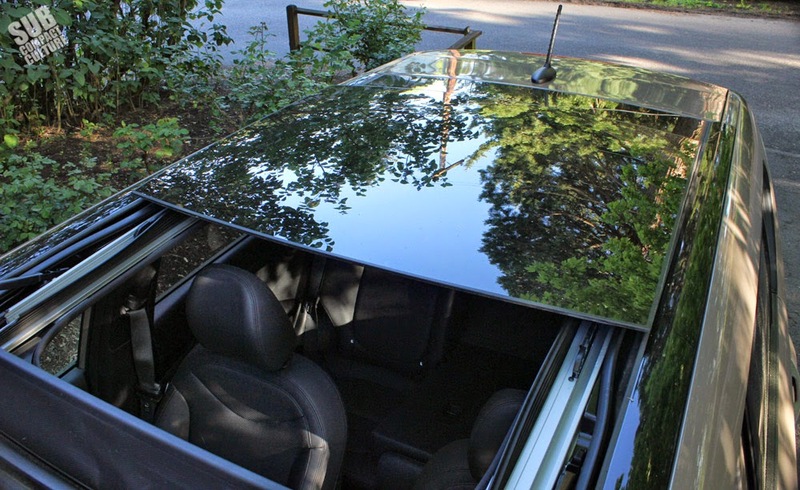 Oh, and that moonroof—that sucker is huge! Its operation is cool, too: You can roll back the impossibly long shade and have a glass ceiling; you can tilt the front panel up; or slide it back—and it does open widely. 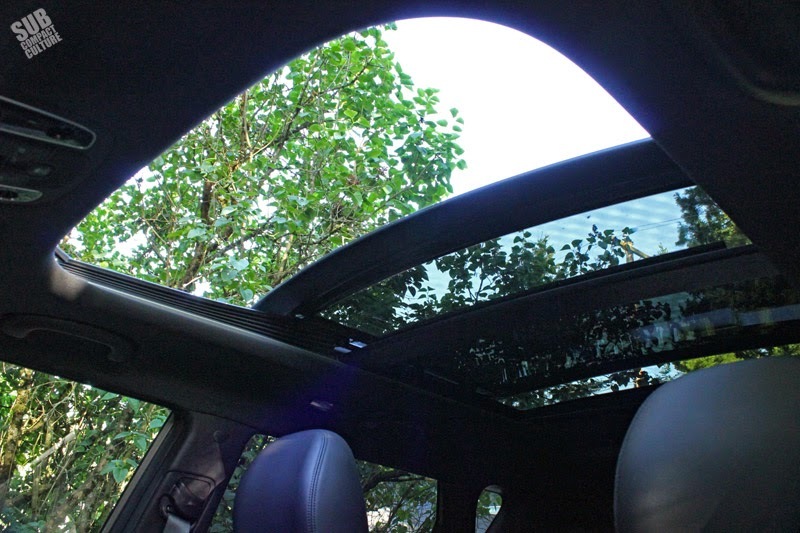 The downside to this mammoth moonroof is an incredible amount of wind buffeting, even with the front windows down. I’m not sure if it’s the sheer size or the shape, but it makes a noise akin to a Chinook helicopter hovering six inches above your head. Lower all the windows and the noise is greatly reduced. But sometimes you don’t want all the windows down. By the way, the back seat is almost as big as the sunroof. It’s like a limo back there. Other upscale bits included heated and air conditioned front seats, a heated steering wheel, push-button start, and a very impressive Infinity sound system. The overall interior design is truly great, and I still love the front speaker design with its little rounded UFO-like pods. Our tester had some rattles, mainly from a back seat that didn’t want to latch properly. This would likely be easily fixed under warranty by a dealer. But the Soul’s interior is modern, inviting, spacious, and comfortable. I like. The Soul has fuel economy ratings of 23 city, 26 combined, and 31 highway MPG. We averaged 24.5 MPG over our week, which isn’t exactly miserly. It is, however, better than its arch rival, the Scion xB, which gets 22, 24, 28 MPG, respectively. Our Soul Exclaim had a sticker price of $26,195 including destination. That’s not exactly cheap, but this premium trim level feels much newer—and more upscale—than the Scion xB, and less strange than, say, a MINI Countryman or Nissan Juke. Amazingly, you can get into a Soul with the base 1.6-liter engine and a manual trans for only $14,900. No, it isn’t going to have the monster moon roof or big 18” wheels (or cruise control, or a bunch of other stuff), but you will get the cool styling. It’s kind of nuts that you can option up a Soul with over $10,500 worth of boxes checked on the build sheet, but indeed that’s the case. 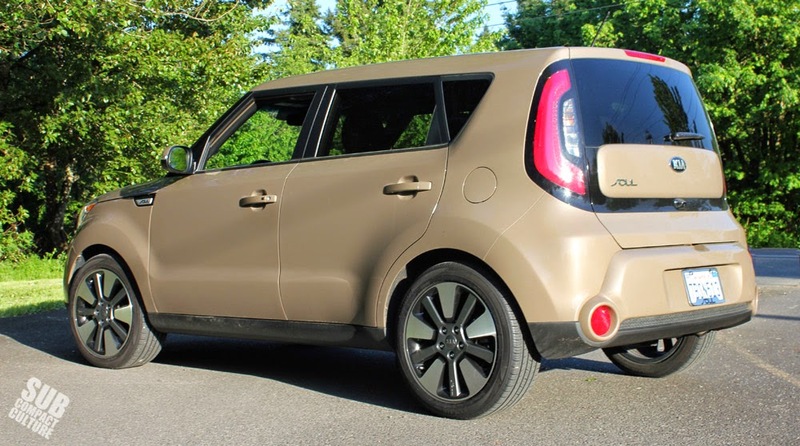 Kia’s Soul has been a red-hot seller for the Korean company, and most Souls will be sold here in the USA. For those wanting a really great interior in a now classically funky package, the Soul Exclaim will likely fit the bill, so long as you’re ready to pay up.